Google coming beleaguered Apple users' rescue? Apple iPhone 5 and, more generally, iOS 6 users up in arms over its rebooted Maps app may be getting some relief in the form of Google Street View, thanks to Mobile Safari. On Thursday, reports surfaced that Maps app users won't have to wait long to get Street View back on their devices, a feature that's said to be part of a rumored Google Maps app for iOS 6 currently in development. That's because, according to The New York Times, the search giant is working on an update to the browser-based version of the popular feature which is scheduled to go live in two weeks. As numerous reports fly back and forth as to whether Google was taken by surprise with Apple's move to use its own map data with iOS 6, the Mountain View, Calif.-based company looks to be scrambling to get its technology back on iPhones, iPod touches, and iPads. While the browser-based Google Maps works fine in Mobile Safari, Street View is not currently supported - but the search giant is said to be working quickly to address that limitation. 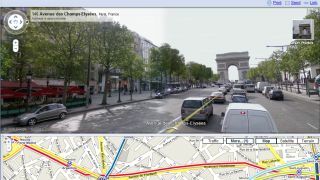 Once Street View is available on the browser-based Google Maps, iOS 6 users will be able to save a shortcut to their home screen and access the services with just a tap. An unnamed Apple executive reportedly told The New York Times Wednesday that Cupertino promises to "pour as much time and manpower into repairing Maps as it takes," but it seems Google intends to play the hero role in the short term.